Dahlia shakers. Flat blooms white ceramic with gold accents. Very different. 1 1/2" tall x 3" across. Old and in good condition.Cork stoppers still intact. 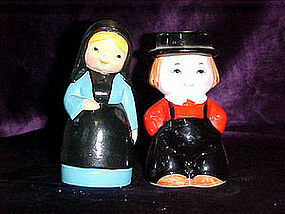 Amish couple salt & pepper shakers. 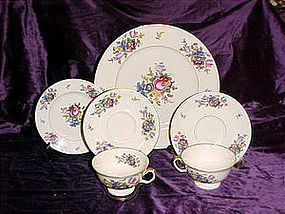 I dont believe these are very old, but they sure are cute for a collector, or just to have for Thanksgiving. 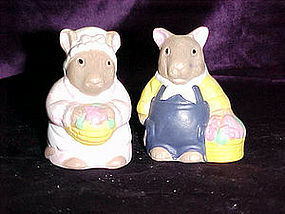 They stand about 4" tall, and are brightly painted. They are in good condition.Rubber stoppers. 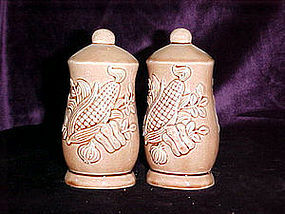 These nice little shakers are a solid medium brown glaze. They have an interesting vegetable motif molded into the shakers. They are 4 1/4" tall, and are stamped "Japan" into the mold under the glaze, and have their plastic stoppers. They are in good condition, with no damages. Unusally heavy olive green footed drinking glasses. They have a mediterranean style to them. The name is Madera. 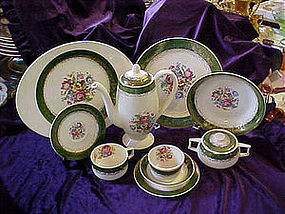 Made to go with Franciscan dinnerware. A very durable glassware. Measures 6 3/4" tall. Let me know how many you need. I think I have 10. Price is per glass to complete your set. Let me know quanity. 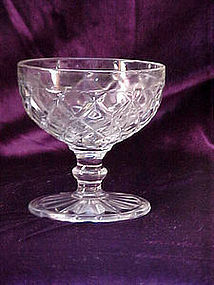 Waterford/or waffle design stemmed sherbert dish. Made by the hocking glass company 1930 - 1944. Perfect condition. I actually have 6 availiable. Price is per piece. Please let me know how many you want. 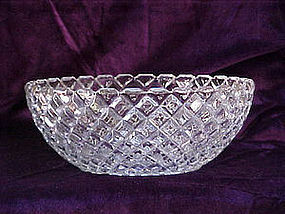 This is the waterford or waffle pattern 7 1/2" bowl on a silver plated footing. Only this is real crystal!! It has a beautiful ring to it. This was not put out by the Hocking glass company. It has the tiny Teleflora signature in the glass. It is 4 1/4" tall overall. A very pretty dish. 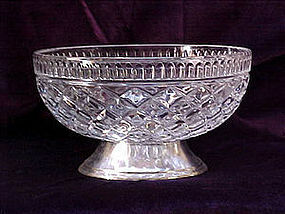 Waterford or waffle pattern 8 5/8" salad bowl. 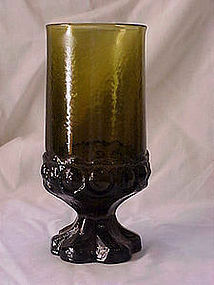 made by Hocking glass company from 1938- 1944. Bowl is 3 1/4" deep. Extremely nice condition! 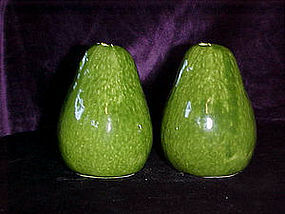 Lifesize avacado salt & pepper shakers measure 4" tall and look like the real thing. They are (avacado green) glazed ceramic, with original corks. They appear to be an older set, looking at the wear on the bottom rim. Excellent condition. No chipping, cracks,or crazing. 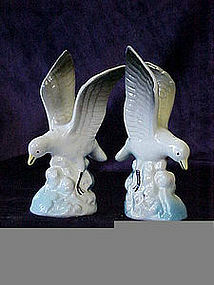 These seagull salt & pepper shakers seem to be swooping over the water looking for food both wings are upward in flight. They measure a little over 4 1/2" to the top of the wingtips. They are ceramic with their natural coloring of white, blues, and greys. No chips cracks or crazing, and have their original plastic stoppers. 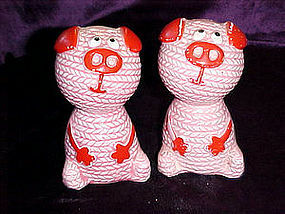 Very odd pair of pink pig salt & pepper shakers. They measure about 4 1/2" tall and appear to be made from pink balls of yarn. The glaze is pink with red accents done in red cold paint. The cold paint shows minor chipping on the ears of one, but still looks pretty fair. I can only say these are very odd! But different! No corks or makers mark. The ceramic has no damage or repairs. Lifelike oranges, salt & pepper shakers. 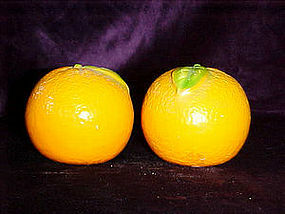 They are the size and texture of small oranges!Ceramic. Almost 3" tall, very nice condition, with no damage of any kind. Has the plastic stoppers intact. So realistic you'll want to peel them! 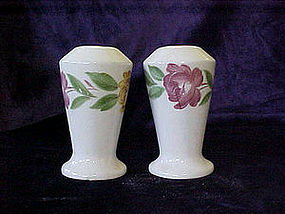 These hand painted pottery shakers have red & yellow roses trailing around the top of the shakers. I'm sure they are made by a reputable pottery maker, but not sure which one. 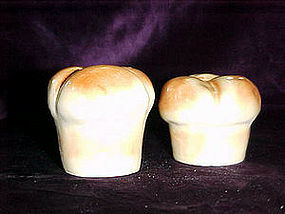 They are 3" tall, have a foot, and broadens toward the top of the shakers. 1 old cork is inside one shaker. 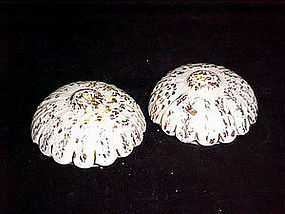 They are in pretty good condition, with a very tiny chip on the underside of the base on one. Not noticeable until turned over and closely looked at. Very minor crazing. 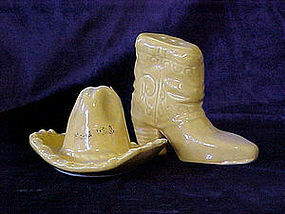 Yellow pottery cowboy boot and hat, salt & pepper shakers. Actually the hat is more of a sombrero type hat. It appears to have a name across the front of the hat,The second word being "Utah", but it is faint and I can't make out the first word. The boot measures 3 1/4" at the tallest point. They are in very, very nice condition. Corks are intact also. Matched ocelot fur collar and pill box style hat. These are vintage, probably 1940,s. The collar type cape has an adorable fastener, and both pieces are lined. Overall they are in nice condition, no crumbleing, or missing fur, and no tears or stains.